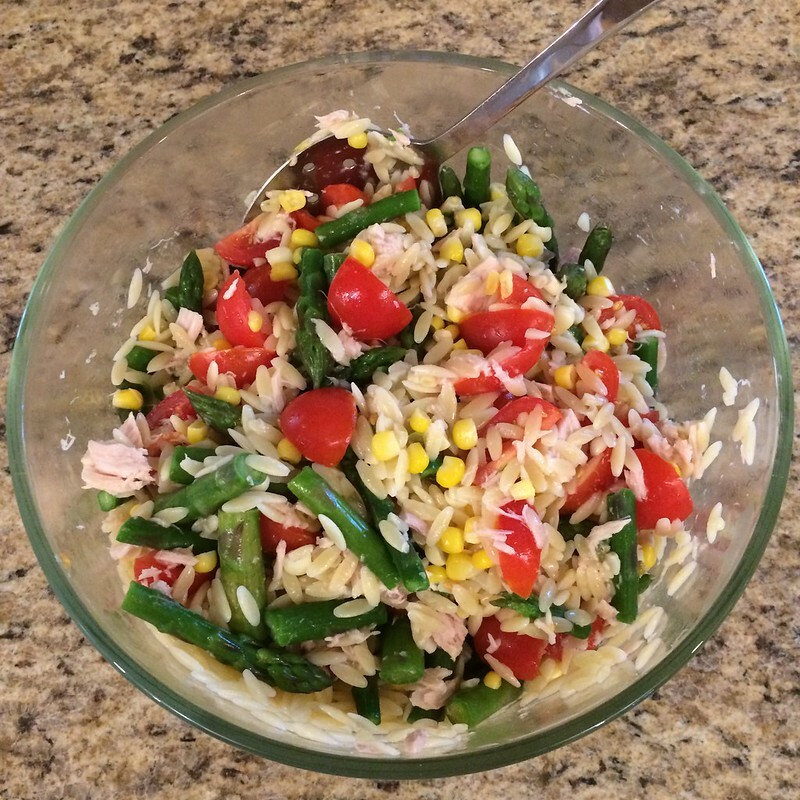 Delicious summer orzo salad with local asparagus, corn, cherry tomatoes, and flaked tuna. All dressed with a light dijon vinaigrette. Really yummy and not much time in the kitchen over a hot stove. 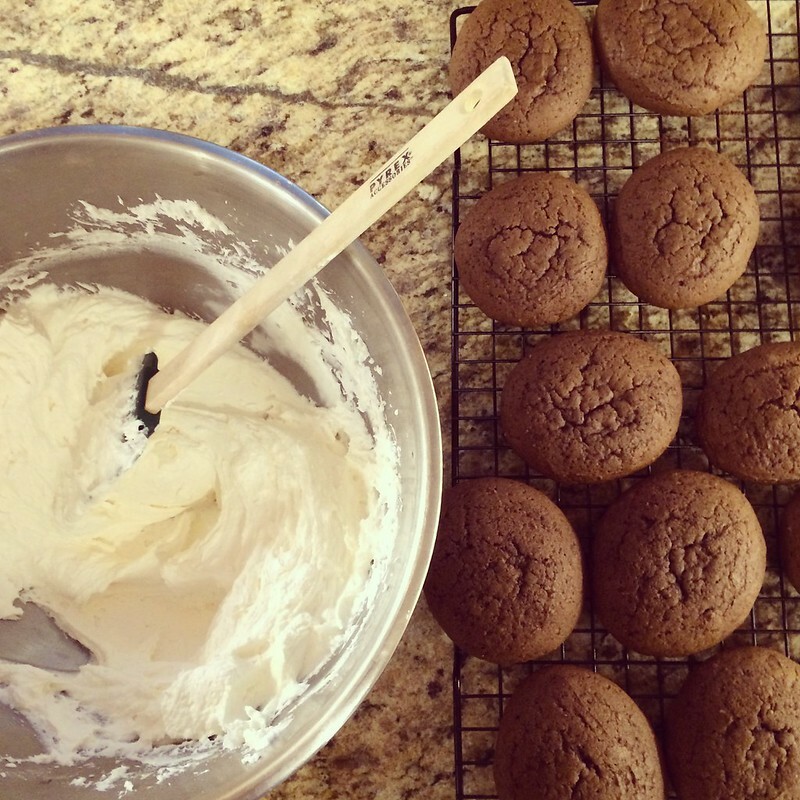 This was a recipe I found in one of Martha Stewart’s Quick Summer Favorites from a few years ago. Of course, since then, I’ve lost or tossed the recipe, but I could remember the basics, so I just took a chance and made up my own basic vinaigrette. Didn’t notice a difference. 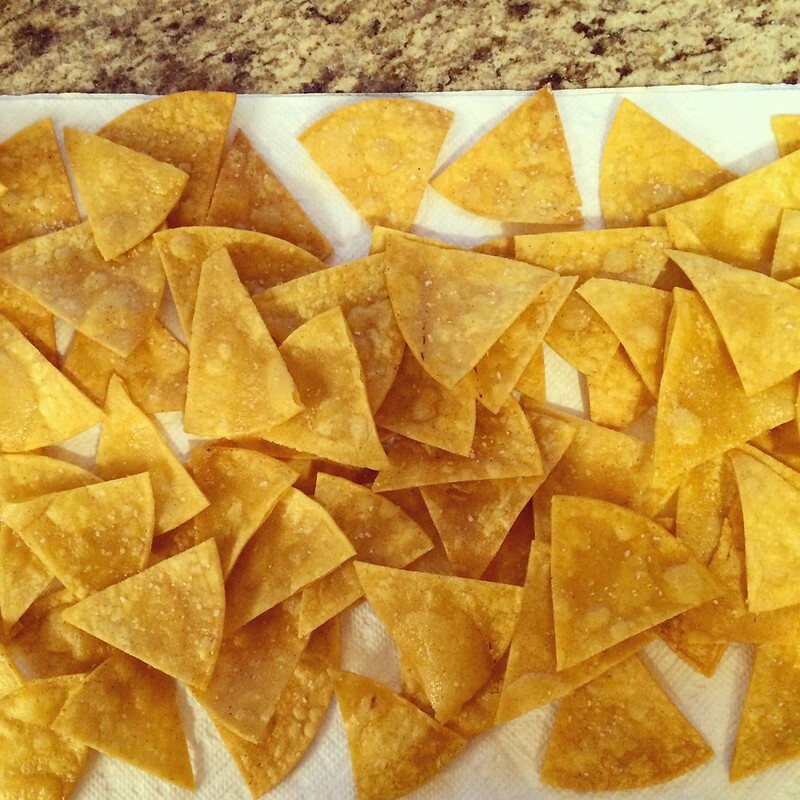 Homemade corn tortilla chips for nachos. Making your own chips is the best way to do it; extra crisp. 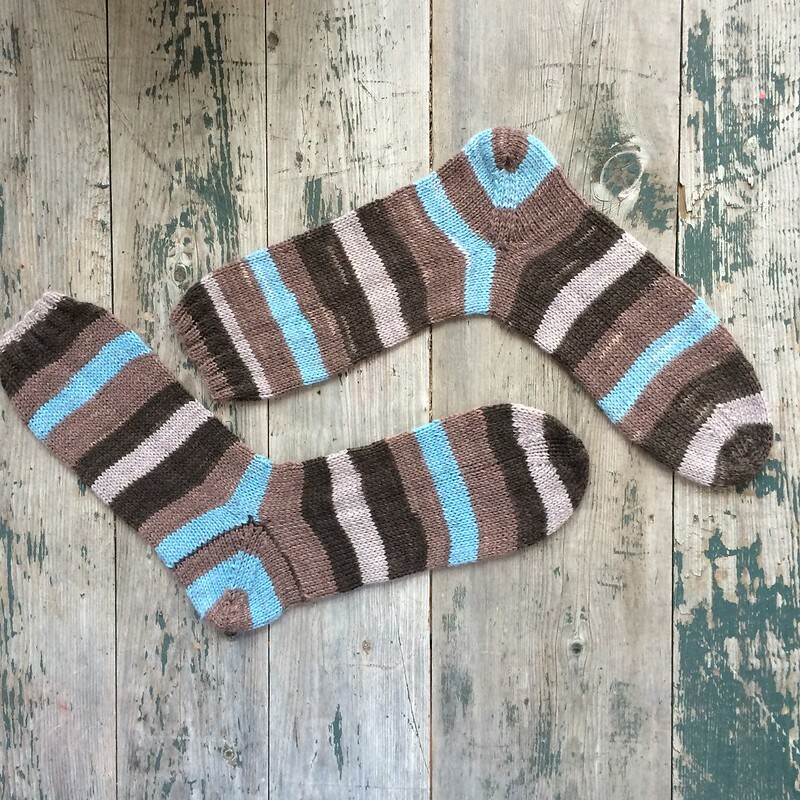 Another pair of basic striped socks for my guy. This was a great stash busting project; the pair used exactly two skeins of Knit Picks Felici Sport in the stream bed colorway, which has since been discontinued. Hooray for stash busting. Check out my notes on the project, which features my favorite type of heel for stripes, the afterthought, here. 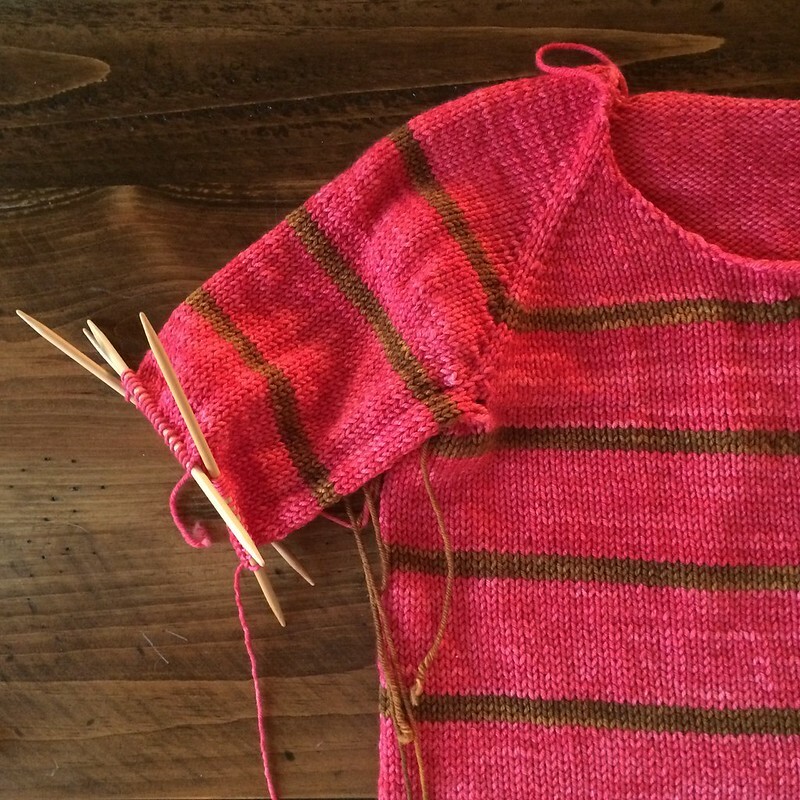 Finally finishing this striped raglan sweater after a short break for a sock knitting project. This knit is really quick. See my previous post for details on yarn, pattern, etc. 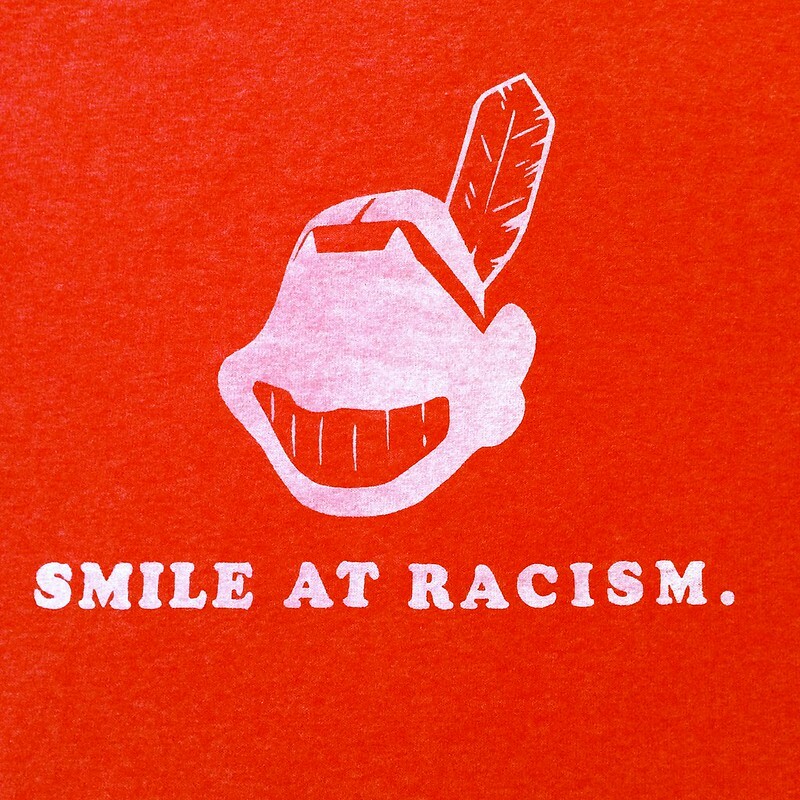 I’ve had numerous requests for “Smile at Racism” tshirts in the last month. I decided to start printing some of those requests and getting them in the mail. Here is my first attempt at pearl white opaque on darker tshirts. It is difficult, to say the least, but I’m getting the hang of it. Check out more snaps of my screen printing endeavors here. 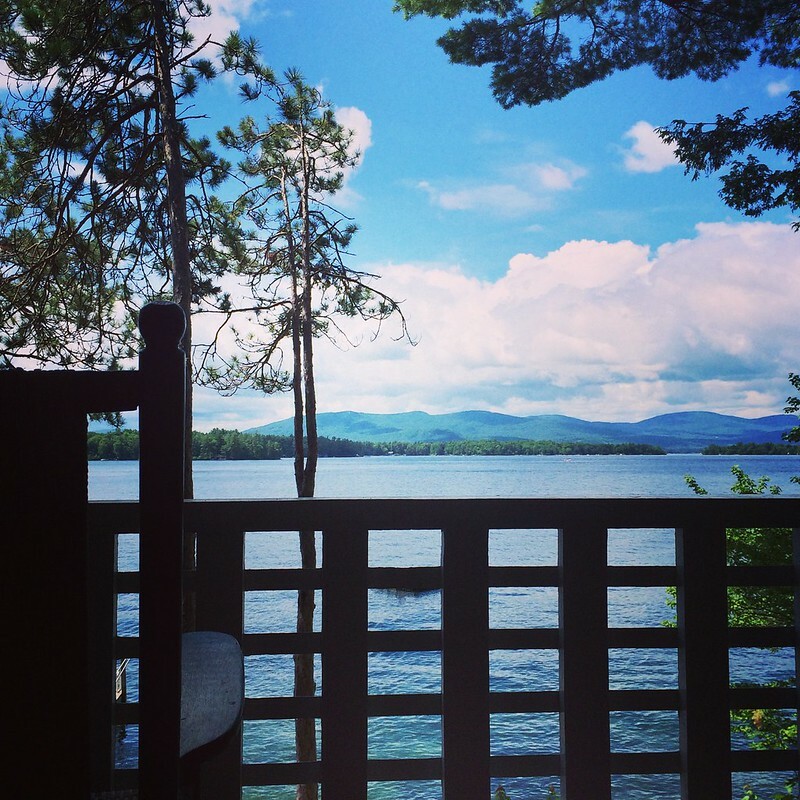 It’s all about lazing on the porch or the dock with book after book after book in summer. Well, that’s my version of bliss, anyway. 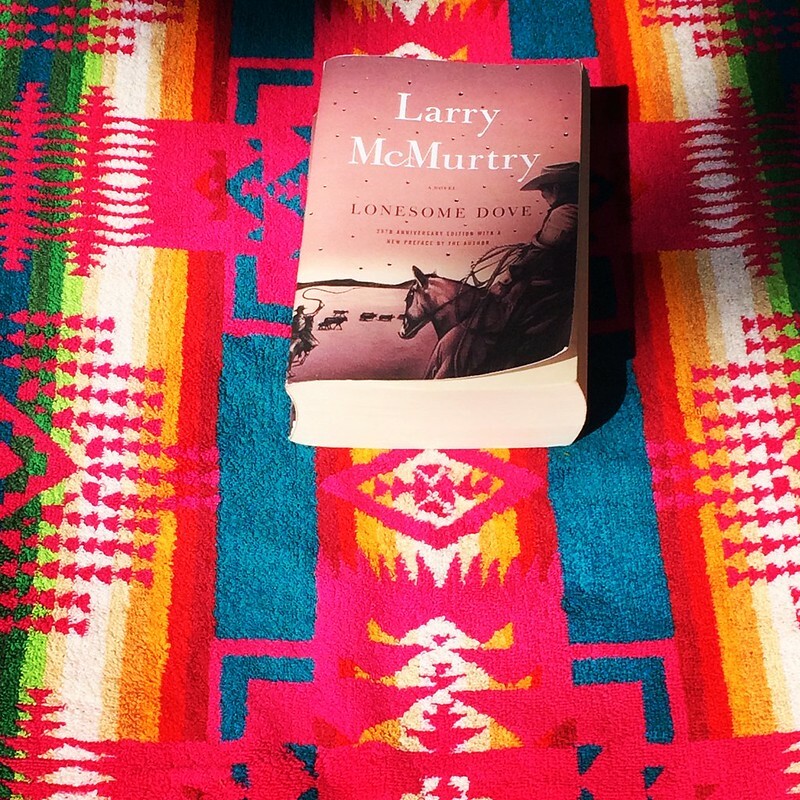 Right now, I’m knee deep in this epic tale, Lonesome Dove by Larry McMurtry. I’ve read a few others, but this is his swan song, I suppose. 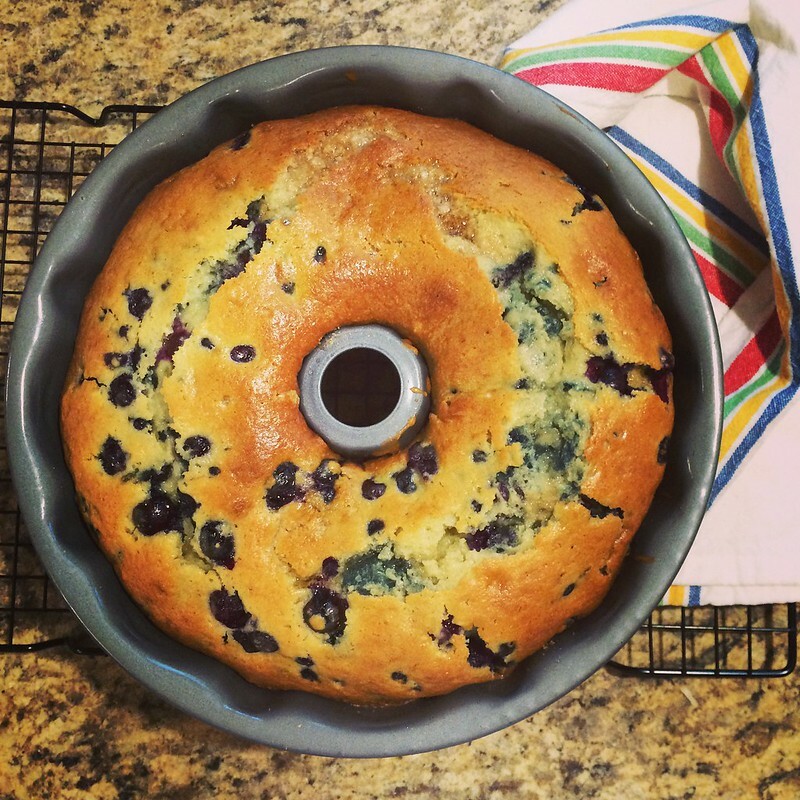 Delicious lemon blueberry bundt cake with an oatmeal crunch topping. This is what summer is made of! 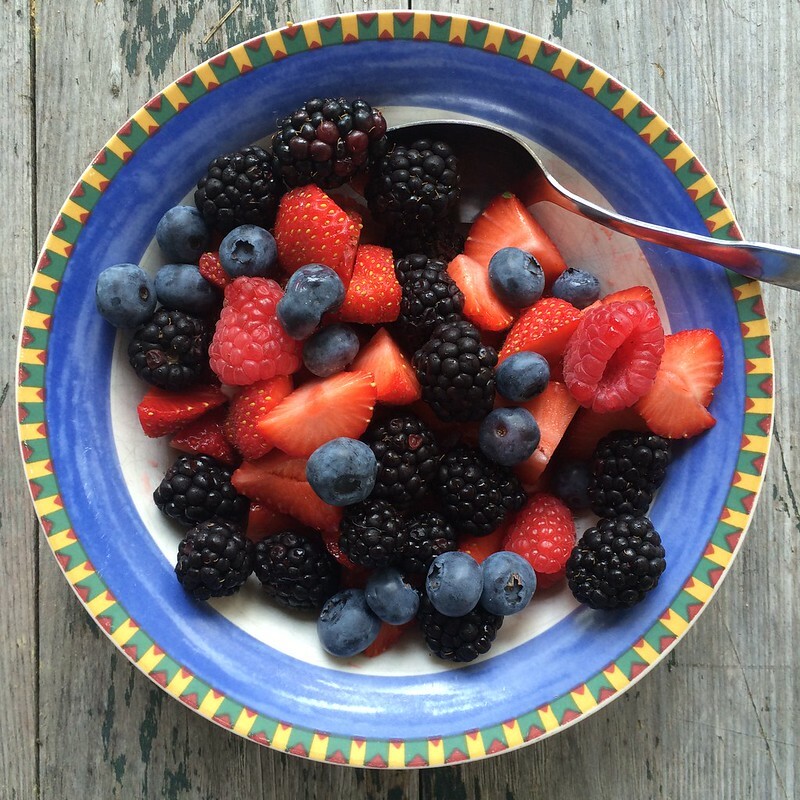 When you live in New England, there’s nothing better than the first delicious bites of summer fruits and berries. I mean, really. We wait all year for a strawberry to taste like a strawberry. This is what I call a bowl of heaven. For some reason, I never actually, in all my years of knitting, have made a really simple, straight forward, top down raglan sweater in stockinette. I’ve started a million; never finished, frogged, and started something different, favoring sleeve details or fair isle motifs or cardigans. Using Jane Richmond’s Ladies Classic Raglan Sweater, I decided to make myself a simple, but classic, pullover. Instead of my usually boring color palette, I opted to instead indulge in some Madelinetosh Tosh Vintage in the espadrilles colorway, which I’d been cooing over for awhile. Pink usually isn’t my thing; but this color, oh it couldn’t be resisted. For the stripes, its more tosh in the glazed pecan colorway. I love the contrast in colors and its amazing how green the glazed pecan looks against the espadrilles colorway. More snaps when its finished. 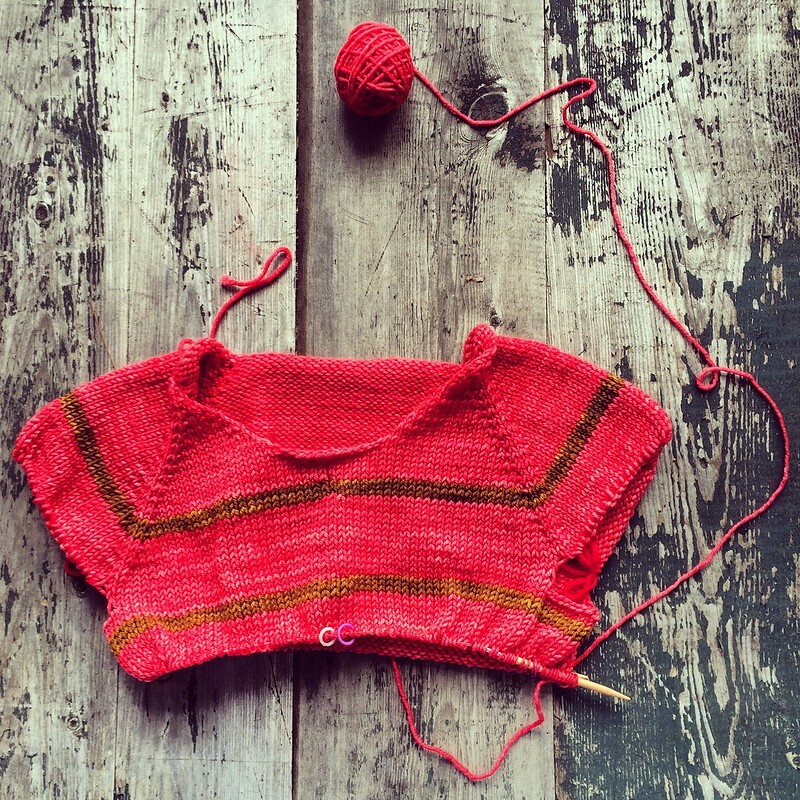 This is a really quick knit–a few days or so. All I have left is the sleeves. More information on the few mods I made at my ravelry page, including no waist shaping (yay boxy sweaters!) and a stretchy bind off.